The 61st Cavalry Division was an Organized Reserve cavalry unit of the United States Army. It was created in 1921 from the perceived need for additional cavalry units after World War I, and was numbered in succession of the Regular Army Divisions, which were not all active at its creation. The 61st was officially disbanded on 30 January 1942, although most of its personnel had been reassigned in 1941. The unit was nicknamed "The Foragers". The Division was composed of personnel from New York and New Jersey. The Division Headquarters was initially located in Rochester, New York, but moved to New York City in 1922. William J. Donovan was the first commanding officer of the 301st Cavalry Regiment. Terry de la Mesa Allen served as the executive officer of the 303rd Cavalry Regiment. Brice Pursell Disque commanded the 151st Cavalry Brigade from June 6, 1922, to April 14, 1937. From April 15, 1937, to June 1939, he commanded the 152nd Cavalry Brigade. ^ Clay 2010a, p. 581. Clay, Steven E. (2010a). US Army Order of Battle 1919–1941 (PDF). 2. Fort Leavenworth, Kansas: Combat Studies Institute Press. ISBN 9781780399171. Clay, Steven E. (2010b). US Army Order of Battle 1919–1941 (PDF). 4. Fort Leavenworth, Kansas: Combat Studies Institute Press. ISBN 9780984190140. Wilson, John B. (1998). Maneuver and Firepower: The Evolution of Divisions and Separate Brigades (PDF). CMH Pub 60–14–1. Washington, D.C.: Center of Military History. Sawicki, James A. (1985). 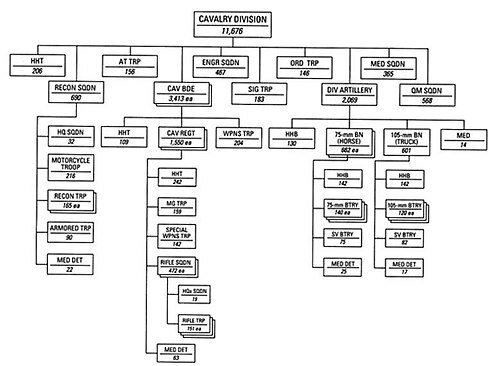 Cavalry regiments of the US Army. Dumfries, Virginia: Wyvern Publications. ISBN 9780960240463. This United States Army article is a stub. You can help Wikipedia by expanding it. This page was last edited on 21 August 2018, at 21:37 (UTC).